Many of them have heard the voice of God, perhaps only as a little whisper, which has led them to search for him more diligently and to share with others the experience of the force which he has in their lives. The discovery of the living God inspires young people and opens their eyes to the challenges of the world in which they live, with its possibilities and limitations. They see the prevailing superficiality, consumerism and hedonism, the widespread banalization of sexuality, the lack of solidarity, the corruption. They know that, without God, it would be hard to confront these challenges and to be truly happy, and thus pouring out their enthusiasm in the attainment of an authentic life. But, with God beside them, they will possess light to walk by and reasons to hope, unrestrained before their highest ideals, which will motivate their generous commitment to build a society where human dignity and true brotherhood are respected. Here on this Day, they have a special opportunity to gather together their aspirations, to share the richness of their cultures and experiences, motivate each other along a journey of faith and life, in which some think they are alone or ignored in their daily existence. But they are not alone. Many people of the same age have the same aspirations and, entrusting themselves completely to Christ, know that they really have a future before them and are not afraid of the decisive commitments which fulfill their entire lives. That is why it gives me great joy to listen to them, pray with them and celebrate the Eucharist with them. 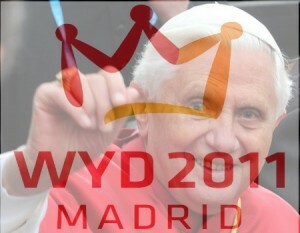 World Youth Day brings us a message of hope like a pure and youthful breeze, with rejuvenating scents which fill us with confidence before the future of the Church and the world.